Is Viktor & Rolf Flowerbomb Perfume Effective? Introduced in 2004, Viktor & Rolf Flowerbomb is a lavish explosion of a blend of luxurious floral tones that sprays on a sweet scent with a hint of citrus, and dries down to leave an extravagant vanilla finish. True to the signature look Viktor & Rolf are known for-couture-Flowerbomb transports the wearer into a reality that is weaved out of her own dreams. The Viktor & Rolf Flowerbomb is made available in various preparations and concentrations: Eau de parfum, Eau de toilette, Eau de Extrême, and Petite. Available in 30, 50 and 100 ml bottles, and presented in a diamond cut packaging that adds to the royalty feel of its scent, is Viktor & Rolf Flowerbomb deserving of the buzz and should it be worthy of your hard-earned US$150? The Viktor & Rolf Fashion House was created by designers, Viktor Horsting and Rolf Snoeren in 1993. Since then, Viktor & Rolf has gained recognition in the fashion industry for their risky, adventurous, and unorthodox take on conventional styles and trends. Later in 2000, Viktor & Rolf started creating and catering to ready-to-wear markets, and even collaborated with H&M to come out with a Viktor & Rolf collection in 2006. For their strangely and pleasantly exceptional talent to recreate the ordinary and regular, they were contracted in 2005 by L’Oreal to conceptualize a scent that is distinctively Viktor & Rolf. The resulting fragrance was Flowerbomb. Although marketed as a mind-blowing explosion of floral scents, Viktor & Rolf’s Flowerbomb leaves on an undeniably sweet-smelling scent, and less on the flowery scents. Distinguishable top notes are those of tea and bergamot, trailed by a sprint of sambac jadmine, rose, freesia and the undeniably rare whiff of orchid. The scent ends with a gentle hint of patchouli. Viktor & Rolf Flowerbomb contains Benzyl Salicylate which may cause allergies and irritations most especially among those with hypersensitive skin. If you have allergy to this substance, reconsider use or, refrain from spraying product on your skin. 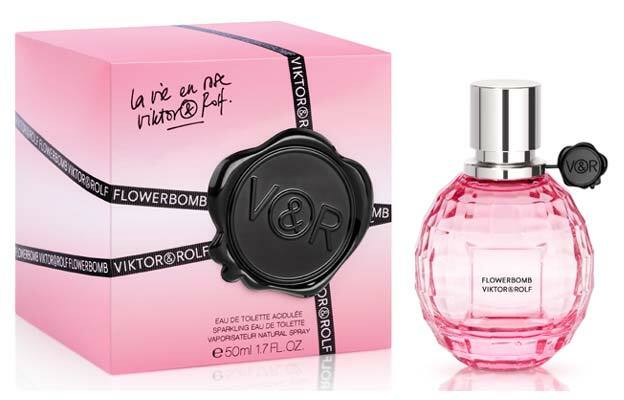 Viktor & Rolf Flowerbomb are among the most counterfeited products. The composition of fake products and imitations are largely unknown. Many have been found to contain greater amounts of water, and even traces of bacteria and urine. Buy Flowerbomb only from authorized resellers and reputed boutiques that carry the label. 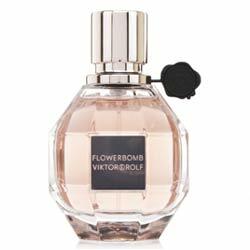 Why you should buy Viktor & Rolf Flowerbomb? Although Viktor & Rolf Flowerbomb possesses a characteristic, unconventional scent, it remains practical for both special daytime and evening events. It will most probably fit the tastes of younger perfume users who are outgoing, active, and like to take risks but, women who are seeking a more sophisticated and elegant scent will probably not be satisfied with this perfume. Still, it might be worth trying if you have developed a liking for perfumes with sweet smells. Keep product in cool, dry places, and refrain from exposing in direct sunlight. Keep lid closed after every use. Product contains alcohol and, thus, can be flammable. Keep away from heat and flame. Every scent blends differently with each of its wearer---that means, it may work for some but not in others. The Viktor and Rolf Flowerbomb may be worth a try if you’ve liked sweet vanilla odors before. There’s no way to know if you don’t try it on first.